I just finished writing up my notes on daggers in northern Italy 1360-1410 https://bookandsword.com/resources/fashion-in-the-age-of-datini/#knives_fighting You can click on the thumbnail images to enlarge them. There are some interesting hilts there which don't seem well known to people interested in late medieval weapons today, and some famous forms (quillon daggers, bollock daggers) are missing. But I am not really a 'weapons person' so maybe some of you know about things which I do not? I would be especially glad to hear about more museums which have daggers from this period. This and the other topics on the page are a fantastic resource for people who are interested in period civilian attire (like me and many on this site). It seems as though the rest of your site is riddled with historical treasures that I shall surely be delving into in the near future! Thanks! You're welcome Jon! I have a blog post on one of my sewing projects in the pipeline ... taking and editing photos just takes time and I have a dissertation to finish. 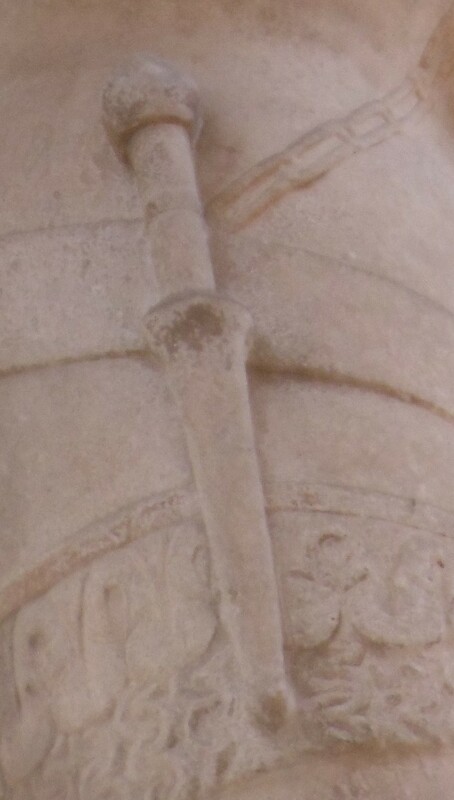 Is this an example of what you would classify as a one disc rondel dagger? 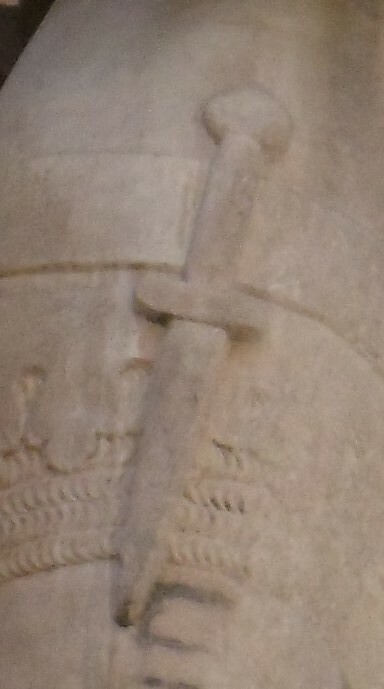 It seems to me one might also consider this as a variation of a quillon dagger. Probably ... its hard to tell with a little painting, but maybe I should include one dagger from that manuscript. I could also include the Getty Fior di Battaglia now that images are open-access ... I just wanted to focus on life-sized art where the details are clearer. I have not read any specialized 'dagger books' but it makes sense to me to distinguish between daggers made like a cruciform sword, with a long narrow steel quillon inserted through the tang, and daggers which have a thicker, shorter wood-horn-bone-ivory guard made with different techniques. It seems to me like cutlers were experimenting with all kinds of ways to build grips and guards (there is even that one double-rondel dagger with a bronze hilt cast on to the blade which Tod reproduced!) Different cutlers would have had different tools and different skills. I'm betting on a rondel with what looks like a conventional pommel might just be a disk but drawn with a bad sense of perspective making it round instead of an ellipse of a disk seen at an angle ? But it could be a disk or globular pommel on a rondel ? The guard looks more likely to be a disk than a short quillon ? Thanks for the replies everyone! I am going to embed full-sized images of some of the life-sized statues and paintings to show some of the types which I think I see. I figure that those, and surviving daggers from the 14th century, are the best guide to interpreting some of the tiny little miniature paintings ... I just don't know the surviving weapons as well as I know the art.